If you think this looks impressive, you are correct. And it tasted as good as it looks. Continuing on my eat-more-veg-meals kick, I saw this recipe from Jeff Mauro and couldn’t resist. #1: obviously it’s a sandwich. My favorite. 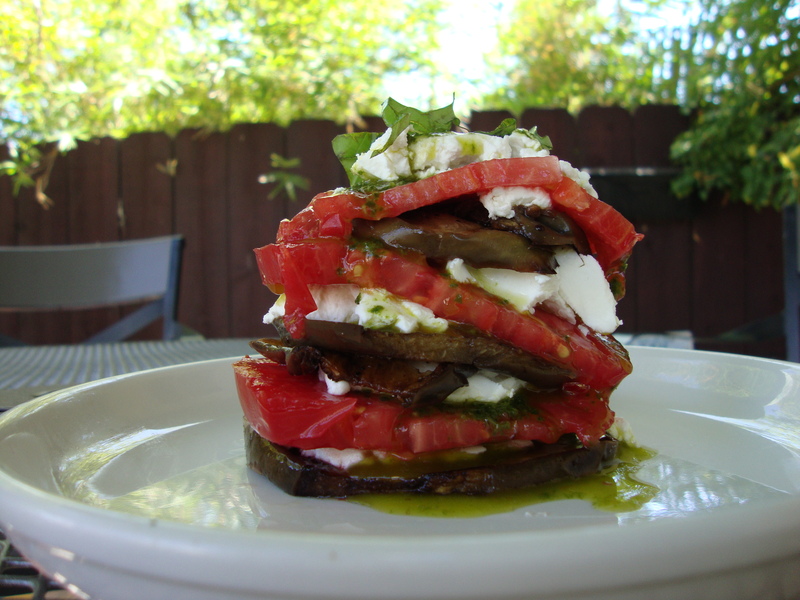 #2: it uses eggplant, also a favorite. #3: it’s Italian. Enough said. This recipe isn’t what I’d call easy, but it was worth it. 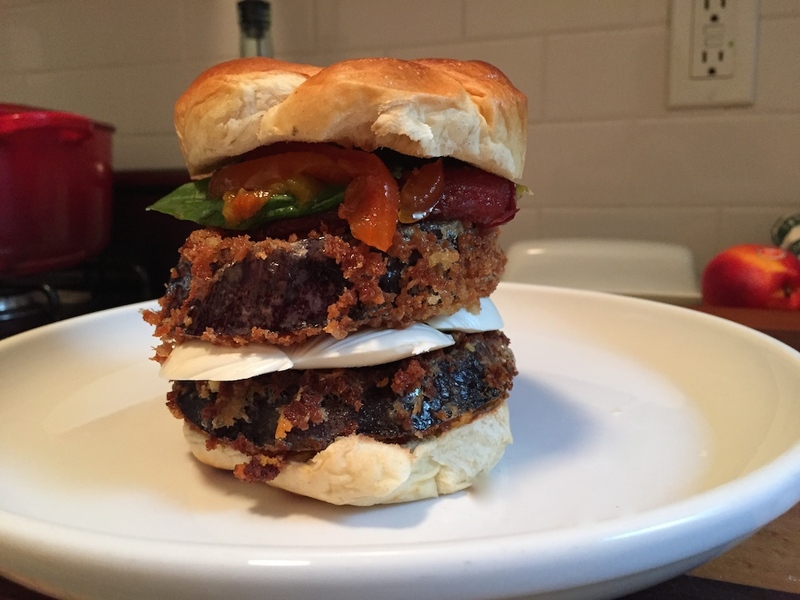 The result is a very filling, meaty sandwich with some great flavors going. Some melty goodness from the cheese, freshness from the basil and spice/acid from the pickled peppers and roasted tomatoes. Pretty amazing if you ask me. It wasn’t easy to get the oil at the right temp, despite using a frying thermometer. 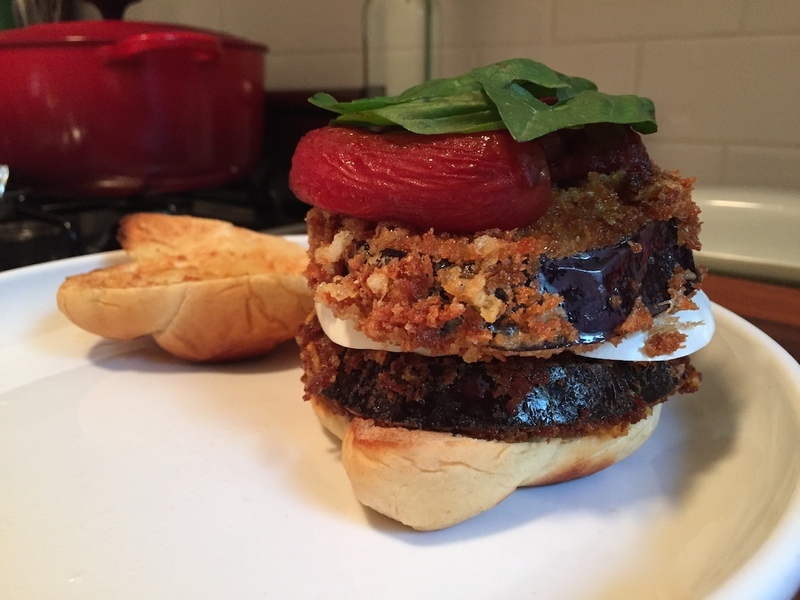 Watch it closely and throw in the eggplant as soon as it’s hot enough. Squeeze the tomatoes when you drain them — I ended up with too much liquid and drained some off the cookie sheet when I roasted them, as well. You want to get them caramelized, which means as little liquid as possible. These are best right after you cook them, but reheat them in the oven and they’re great as well. Preheat the oven to 375 degrees F. Line a baking sheet with a silicone liner and another baking sheet with a wire rack. 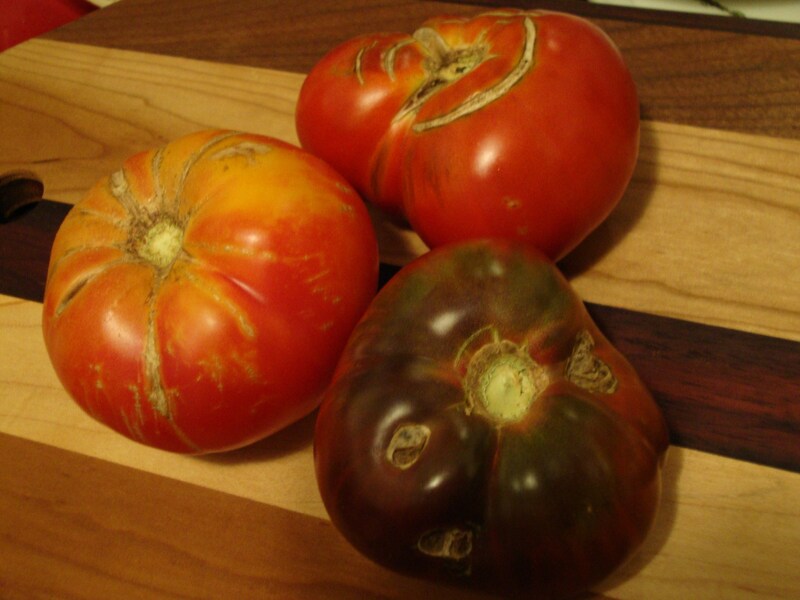 For the eggplant: In a bowl, toss the tomatoes with the balsamic vinegar, olive oil, brown sugar and some salt. Evenly place the tomatoes on the lined baking sheet. Place in the oven and roast until slightly caramelized and dried out a bit, 20 to 30 minutes. Set aside. Set the eggplant slices on the wire rack (if you don’t have a rack you can use a colander set in the sink). Sprinkle salt on each side of the eggplant and let the salt do the work for 15 to 30 minutes. Once the salt has released moisture from the eggplant, pat the slices dry with paper towels. Then sprinkle each side of the eggplant with pepper. Set up a standard breading station with the flour in one shallow dish, the eggs in another and the panko mixed with the Parmesan in a third dish. Dredge each eggplant slice in the flour, shake off any excess, dip in the egg, let any excess drip off and then coat in the panko. Set aside on the wire rack and repeat. In a large cast-iron skillet, heat 1-inch vegetable oil to 350 degrees F.
Working in small batches, fry the eggplant slices, turning once, until golden brown, 3 to 5 minutes a side. Using a pair of tongs, transfer back to the wire rack. Repeat with the remaining eggplant. Make sure to season the eggplant as it comes out of the oil. For the sandwich build: Butter and griddle both sides of the buns until golden and crispy (you can toast the buns as well). 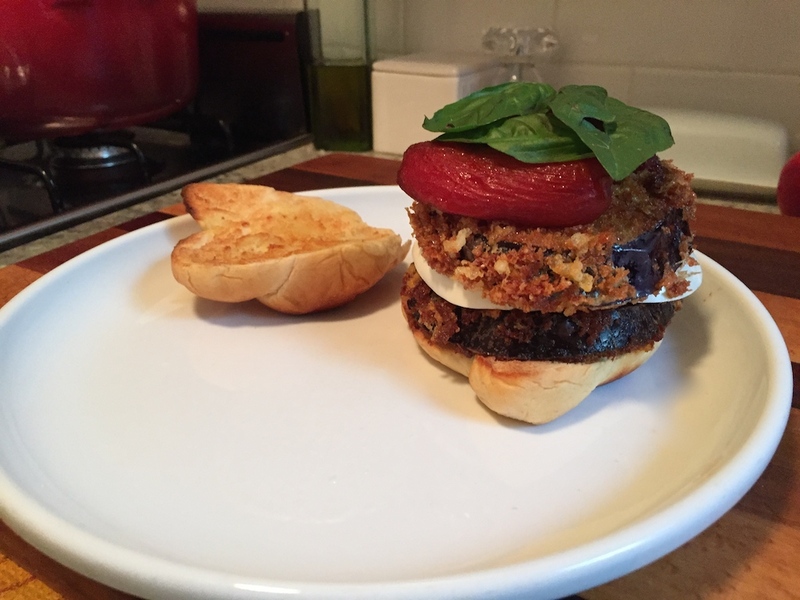 Tear the burrata over the bottom buns, then add 2 hot eggplant slices, some roasted tomatoes, a few pickled cherry peppers and some fresh basil leaves on each bun. Serve to applause.